Oliver started school this week, so I am down to one full-time sidekick until next week when Patrick starts preschool (he’ll be going three days Monday-Wednesday). One full-time sidekick makes things slightly easier to accomplish than two, so this morning the little one and I organized my drawers of sewing supplies. I’m a slightly shocked at the volume of craft/sewing stuff I have around here. It is tucked away into bins around the garage, a shelf in the corner of the dining room, a little here, some there, one day I dream of it all being consolidated into the location where I won’t have to pack it all up a meal time, but this is what I have for now, and the dining room table makes a great work surface (even if it does make lunch somewhat inconvenient). 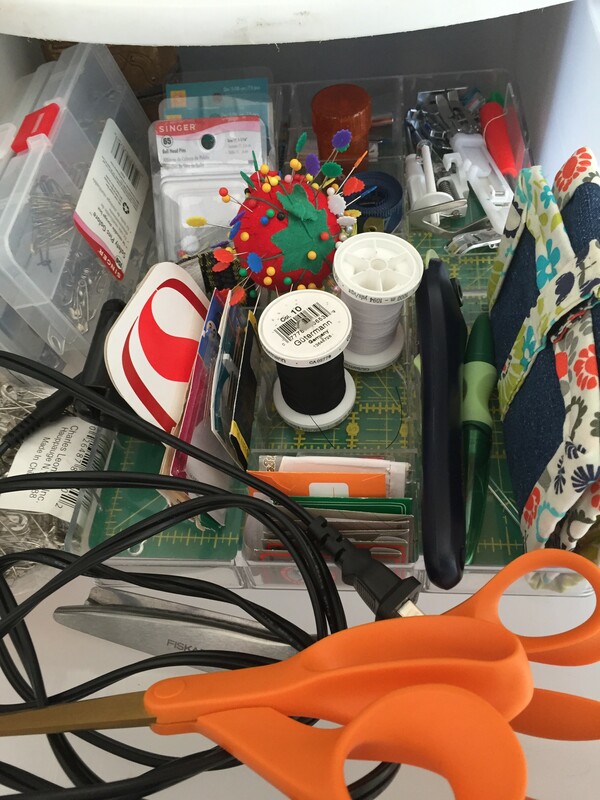 I did not take before photos, so you will just have to trust me when I said my sewing drawers were a total mess. I came across no fewer than a dozen needles (many still had vestiges of thread on them) laying loose in the tray, or wrapped around my pins. For a while, I’d been sticking the needles in a scrap of red felt, hoping for the best, but with so many laying around I decided I needed to do something more. 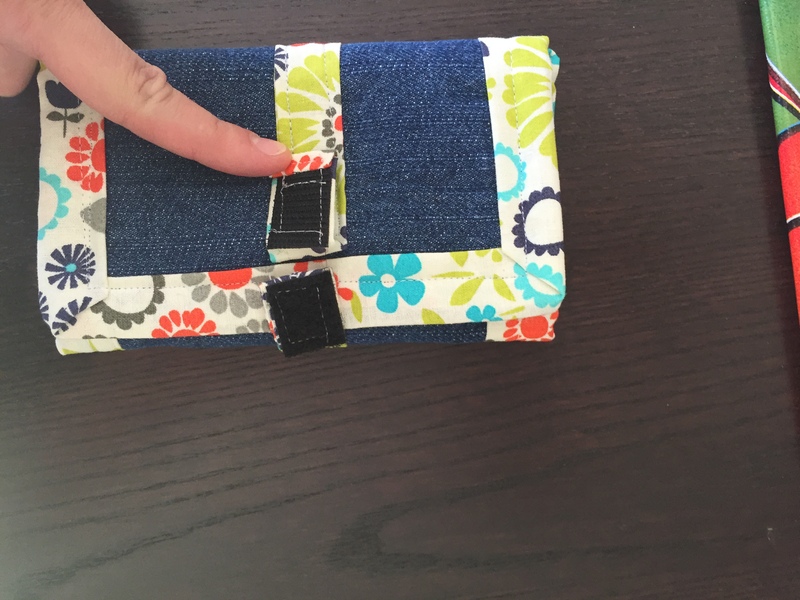 I googled around for “DIY needle wallet” for inspiration, and then decided to just go for it with materials I already had around the house. 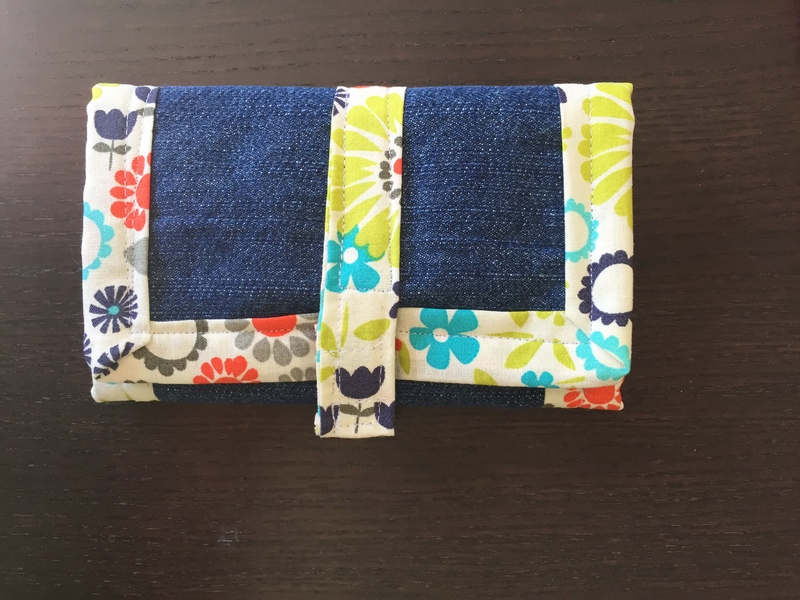 The end result is a 6 x 11 inch (approximately) tri-fold wallet comprised of layers felt, encased in denim and held together with homemade bias tape. It velcros closed, and holds even my large doll needle. The denin and contrasting fabric in the bias tape are from another project (a work-in-progress). 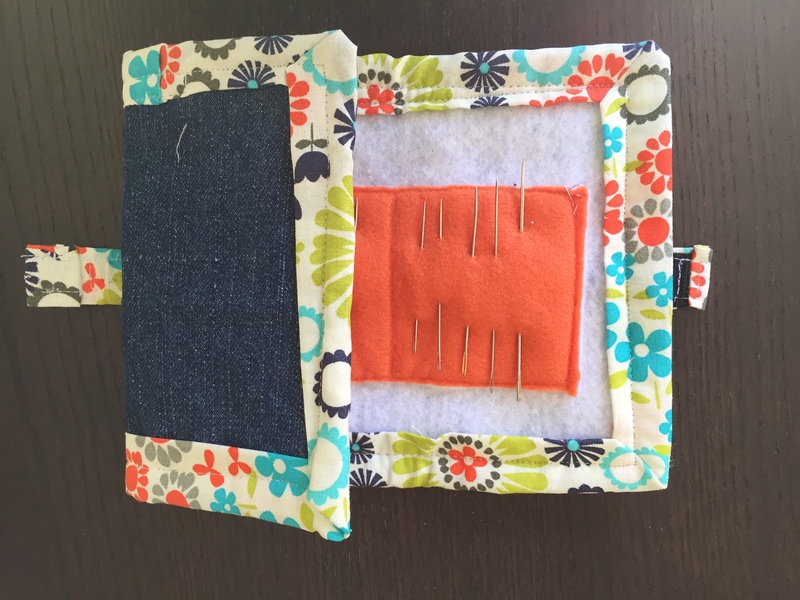 The wallet is made of four layers, the denim layer, a white felt layer, and then a smaller rectangle of white under the smaller rectangle of orange, so the needles can poke through that and not out the denim on the back. My initial design had the bias tape extended so it could be tied in a bow, but I like the velcro closure better. I did not take photos of the process, as I sort of made it up as I went along. I’m mostly pleased with how this turned out, although next time I may cave and find (and use) my bias tape maker (and the iron, and maybe make my seams a little neater). The needle wallet only holds my sewing needles, not my sewing machine needles which are in their own special state of disarray. 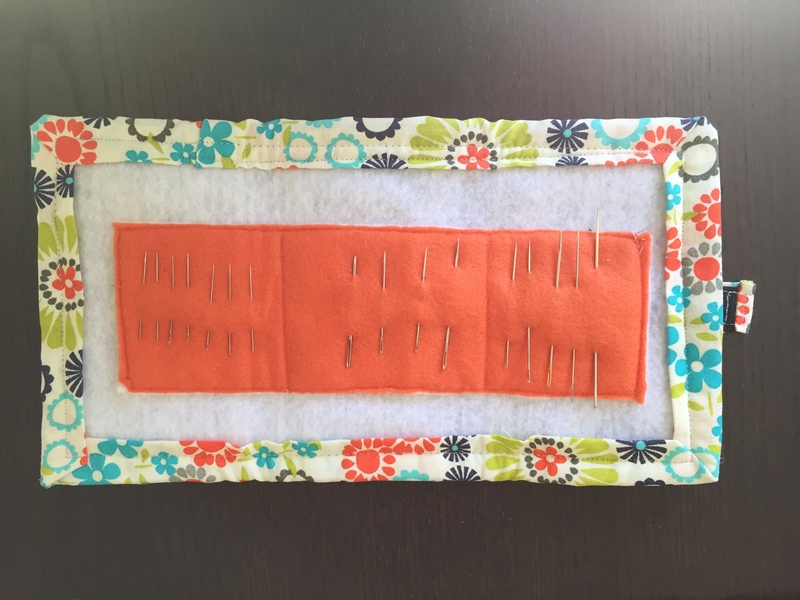 This also left me wondering when I became the person who had different kinds of sewing machine needles… probably when I did the denim quilts. 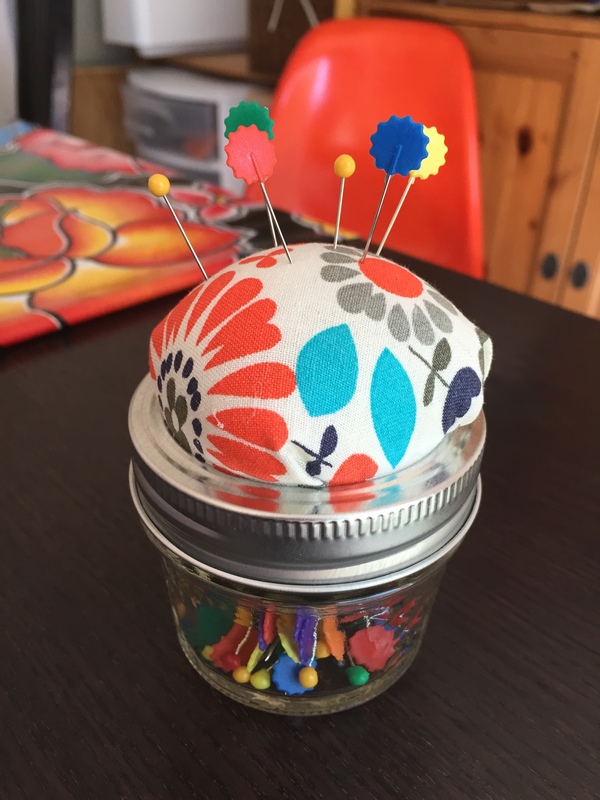 I also made a little mason-jar pincushion (you can easily google for a tutorial if you’re curious) that holds my growing collection of pins that didn’t fit in my tomat0-shaped pincushion — yes, it coordinates with the needle wallet, that’s the fabric I had most readily on hand and the denim felt too heavy.